We are fascinated with crime, police investigations and high-profile trials. I’m not sure why, but despite all of the evidence to the contrary, perhaps we need to believe that sometimes justice prevails, truth wins, the bad guys get their due. 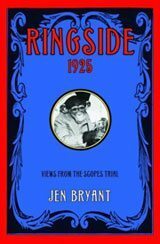 I’ve written novels about two of these famous trials, but although they took place just ten years apart, generated a great deal of media attention, and are still used as examples in laws schools across the U.S., they differed in very significant ways. Whereas the Lindbergh baby kidnapping trial lasted six long weeks in the winter of 1935, included a murder victim (Charles Lindbergh’s 20-month-old son, “little Charlie”), an accused man (Bruno Richard Hauptmann), and a laundry list of circumstantial evidence, the Scopes Evolution trial was almost purely a tactical, intellectual, and often emotional debate between William Jennings Bryan (a fiery orator and three-time presidential candidate), and Clarence Darrow, the most successful trial lawyer in the country. 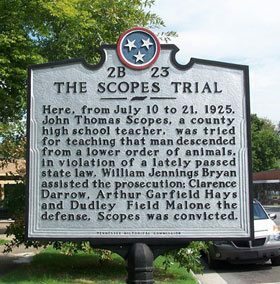 The “defendant,” John T. Scopes was a young, first-year high school teacher and a football coach, who agreed to be arrested (a formality, he was never actually detained) so that the Butler Act, a Tennessee law which forbade the teaching of “any theory that denies the story of divine creation as taught by the Bible and to teach instead that man was descended from a lower order of animals” could be challenged in a courtroom.